A trainee reporter on a regional daily hit the ground running on her very first day in the office by scooping a front page splash. 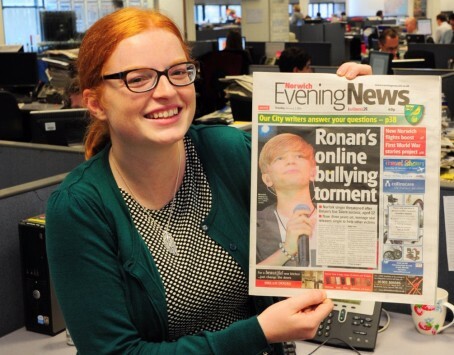 Polly Grice scored a page one story in the Norwich Evening News with an article about Britain’s Got Talent star Ronan Parke suffering from online bullying. Having joined the Archant-owned newspaper for three weeks before heading to Newcastle to begin her training, Polly was asked to put a call in to Norfolk born-and-bred singer Ronan Parke, on the day he released an anti-bullying single. She was given the challenge of finding out if the reason Ronan, who shot to fame after appearing on Britain’s Got Talent, was supporting the charity Kidscape was because he had suffered bullying himself. Polly Grice with her front page splash. It transpired he had and what emerged was a front and page three piece for the Norwich Evening News headlined ‘Ronan’s online bullying torment’. Archant Norfolk digital editor David Powles said: “It’s a vital skill of journalism to be given a sniff of an angle like this and then turn it into a cracking story. Reporter gets front page on newspaper she works at after being told to put in a call. Big whoop. Well done, Polly. It’s a great way to start your career and it’s a feat you should repeat every time you join a newspaper. It has worked for me, right up to the nationals where I now work. Nothing gets you respect quicker than a splash in your first week. It makes the old timers notice you and makes the others accept you. Of course, it also stings them into action to rival you! Don’t rest on your laurels, mind. To be fair this story was on Look East before it went in the Evening News. As a fellow red head – and we must stick together – well done! However, your future splashes won’t be so easy to come by! So it’s a press release story, basically?